Nair Told and Untold is a short story collection which comprises of 15 short stories mostly set in the southern part of India in the beautiful state of Kerala. Kerala remains an elusive mystery to me. With its beautiful and vibrant traditions and equally fascinating art, music and literature, I have always loved reading books set in Kerala. In this book, all the fifteen stories have a central character called Nair. This gentleman called Nair is always taking up different roles, occupations, and personality. He is the one who imparts to each story its vivid charm and character. But that doesn’t indicate that the stories are similar. In fact, they hardly have anything in common. What I enjoyed the most? The thing which I enjoyed the most in Nair Told and Untold is definitely the character of Nair which changes in each story. He is a bank manager in one, a car driving instructor in another, a reputed professor in one, a love-struck cubicle dweller in another, a devoted family man in one and a cheating husband in another. The variety in each characters’ traits, habits, peculiarities, eccentricities is just amazing and something to look forward to. I also enjoyed the way most of the stories in Nair Told and Untold are set in the simplest of backdrops. A frugal breakfast in a small eatery, a driving lesson in an ordinary motor driving school, a basic lunch in a small roadside dhaba, a mundane train journey, a routine residential society meeting etc. These are a few backdrops against which the author has penned his stories. The mundaneness of these settings ensures that the reader, no matter where he or she comes from, will undoubtedly associate with most of the stories. Mohan Nair makes use of everyday experiences and weaves tales around ordinary people. I liked the way he passionately writes about the various aspects of his culture. The book provides some great insights into the Malayali culture. Mohan also uses his stories and characters to convey social messages. Almost every story has an underlying moral value; a lesson in ethics. This lesson, however, is not easily visible. It is embedded in the very fabric of the story and the reader will have to do more reading between the lines to get to that moral lesson. There were quite a few stories in Nair Told and Untold which appealed to me in their uniqueness and freshness. In The Canine Conspiracy, Nair is a police officer in the Narcotics cell of Kerala police who is deployed at the Trivandrum airport to assist the famous canine Tommy in his drugs-smuggler-grabbing activities. Initially hesitant, he ultimately forms a bond with the canine and together they manage a few adventures. What Really Mattered is a story which sees the young Nair marrying a foreigner Kate. Newly wedded, he brings his wife to his hometown which he is visiting to attend the annual festivities that are an integral part of his family. Nervous and sceptical about how Kate will adjust to this unknown culture, he is in for a shock when Kate manages to surprise everyone with her magnificent performance in the festival. The Surgical Strike is a story in which the talented cook Nair is recently employed in the household of Thomas Sir. Vilasini, the other cook who has been there for a much longer time feels threatened by the range and diversity of Nair’s cooking skills and as a result, she devises a plan to throw Nair out. Only Nair is not an easy target and has some pretty amazing tricks of his own to counter hers. 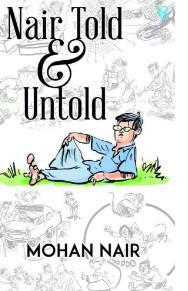 Overall, Nair Told and Untold is a good read for somebody who enjoys short stories. It creates a fascinating milieu of Kerala and its people and will be a treat for anybody who decides to pick this book up. The writing is simple – at times amateurish but it has a soul. The author has a lot of potential and I am sure with time, his creativity and writing will only shine brighter. The only thing that I did not enjoy in this book is the poor quality of editing. There are many editing errors which unnecessarily become an eyesore and take away the reading pleasure. Just getting rid of those unwanted errors will add so much more to the beauty of this book. This book will appeal to you if you read and admire short stories from authors like Ruskin Bond, Sudha Murty etc. It will also be a good read if you enjoy reading about small towns, its people and culture. Skip the book only if you cannot tolerate a few editing errors and if you aren’t very fond of short stories.